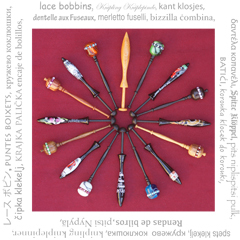 The Bobbin Shop specializes in quality hand turned and hand painted Lace Bobbins. 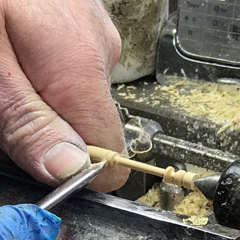 You can buy lace bobbins in wood & bone, made the following styles; Midland, Honiton, Long Square, Short Square, International Square, Bayeux, Flanders, Binche and Continental. 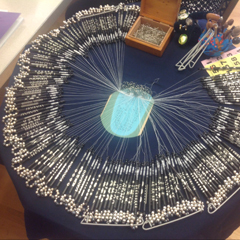 Over 30 Years Experience of Lace Bobbin Making. The Most Beautiful Commemorative Lace Bobbins for all Occasions. UK & International Bobbin a Month Club. Lace Days, Fairs & Meetings Attended. Unique Ebony with Pewter Inlay Lace Bobbins. Bobbins Sold with or without Spangles. Over 150,000 Bobbins Sold Worldwide. Computer controlled engraved bobbins. The finest text and graphical designs you can get. All my bobbins are available to buy online. They are all hand made with the exception of some of the continental styles of bobbin. All the artwork is either hand painted or engraved. With such a large range of designs in up to nine different bobbin styles, three different materials and up to twenty eight designs in one collection. I tend to make orders up on demand. If you do need your bobbins for a certain date then please contact me before buying online so I can do my best to meet your deadlines.